In light of today’s decision by the Supreme Court, let us call upon the great cloud of witnesses who testify to what living in truth, justice, and freedom truly is. Blessed Martin Luther King, pray for us. Blessed Absalom Jones, pray for us. Blessed Frederick Douglass, pray for us. Blessed James Theodore Holly, pray for us. Blessed Richard Allen, pray for us. Blessed Edward Demby, pray for us. Blessed Henry Delany, pray for us. Blessed Thurgood Marshall, pray for us. Blessed James Weldon Johnson, pray for us. Blessed Pauli Murray, pray for us. Blessed Elizabeth Cady Stanton, pray for us. Blessed Amelia Bloomer, pray for us. Blessed Sojourner Truth, pray for us. Blessed Harriet Tubman, pray for us. Blessed Jonathan Daniels, pray for us. Blessed Alexander Crummell, pray for us. When she came in did you see her? You are lying around the banquet table with the others. Perhaps you missed her when you rearrange the pillow you are resting on. Or you are listening closely to what Jesus and Simon are talking about. You are riveted by their conversation. It’s not surprising that you don’t notice her at first. After all, Simon has put on a public feast for Jesus. At these kinds of things all sorts of people crowd in along the walls to hear the conversation flowing around the table. And the people in town really want to hear Jesus. He had preached in the synagogue earlier and now Simon has put on this banquet for him. People want to hear more. Some think he is even a prophet. Simon himself wonders if this might be true. That’s why he has hosted this banquet in the first place. So you are there with the invited guests lying around the table. And then there are the other men and women along the walls. You really don’t know if she has been there all along or if she came in later. But then while Jesus is talking, she kneels down by his feet. You see it all happen because you are just across the table from him. At first you think she is going to rub the ointment in her little jar on Jesus’s feet. You and others at the table saw how Simon had forgotten to offer Jesus water for his feet. Simon had been so busy getting ready that it just didn’t happen. You think at first that maybe Simon had sent this woman to clean Jesus’s dusty feet. But then she bursts into tears. Jesus doesn’t know she is behind him and he is startled. But he lets her weep. Soon the tears bathe his feet. Then she surprises you even more. She undoes her head wrap and uses her hair to wipe his feet. And then, even more surprising, she kisses his feet over and over. Only after that does she do what she came to do and rubs ointment on his feet. Doesn’t Jesus know who she is? Isn’t that the sort of thing a prophet knows? And now you remember that you had seen her earlier today. She was there when Jesus taught this morning. She was in the crowd around him afterwards. And now Jesus turns gently to Simon. He can tell what Simon is thinking and he tells a story. He is explaining that this woman has been forgiven. Her sins have been forgiven and Jesus has done it. He forgave her of her sins after his talk today. She wanted to show her gratitude with the ointment but burst into tears before she had a chance. Is that all it took for her to weep so much? And you see the face of Simon – how it changed from annoyance to tenderness. And you wonder, can you be forgiven too? What would it take for you to weep like her? You are moved by it all so much that you get up and leave the table. People are talking to their neighbors so you think no one notices. But Jesus follows you outside. And it all comes tumbling out of you, out of your mouth, from your heart. All of it – everything you have kept hidden. Everything you thought nobody but God knew. All of it – every last bit of anger and pettiness and jealousy and greed. And now you hear his words. He tells you that you have been forgiven. He assures you of God’s love. And he tells you to sin no more. And then he goes back into Simon’s house. And you return to the banqueting table. You are at the table. The woman is on one side of you. Simon is on the other. And from across the table, Jesus looks into your eyes as he hands you the bread. You take it and you eat it and you pass it. This meditation was delivered today in All Saints Chapel at Church Divinity School of the Pacific in Berkeley, CA. You have in front of you something called a carmina figurata. It was a form of writing and meditation popular in the 8th and 9th centuries in the theological circles of the court of Charlemagne. This poem is by the great theologian Rabanus Maurus, abbot of the monastery at Fulda. It was composed sometime in the 820s. This carmina figurata is titled In honorem sanctae cruces, or, In Praise of the Holy Cross. 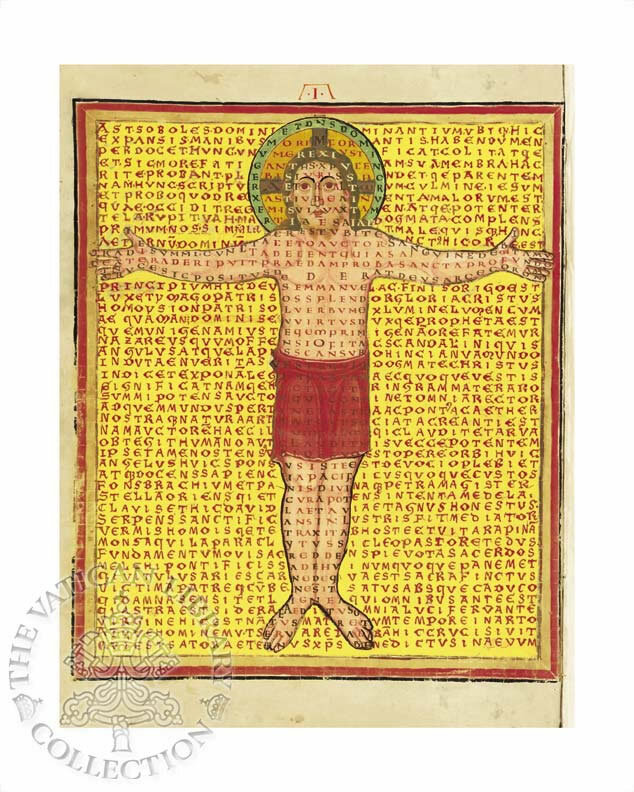 We have here an image of Jesus as a stiff body with open eyes. This is sometimes called the Christus Rex – Christ as an unvanquished King. We have here Christ hanging on the cross but also defeating the cross, showing forth his immortality and defeat of the cross. Indeed the cross has entirely disappeared. It has been replaced by words praising Christ and proclaiming his victory as the fully human and fully divine King of kings and Lord of lords. Those are the words we read around his nimbus, his halo – King of Kings, Lord of Lords. This poem hails Jesus Christ as the author of the cosmos, the one who is of the same substance with the Father. He has conquered death and conquered it so thoroughly that we now use the cross as a sign of victory. Rabanus intended his viewers to meditate on this picture poem. He wanted his viewers to not only to look at the images but to sense their spiritual reality. Christ has been lifted up from the earth upon the cross. He draws all to himself and as he does the cross disappears and the embrace of his arms remain. I invite you into meditation.